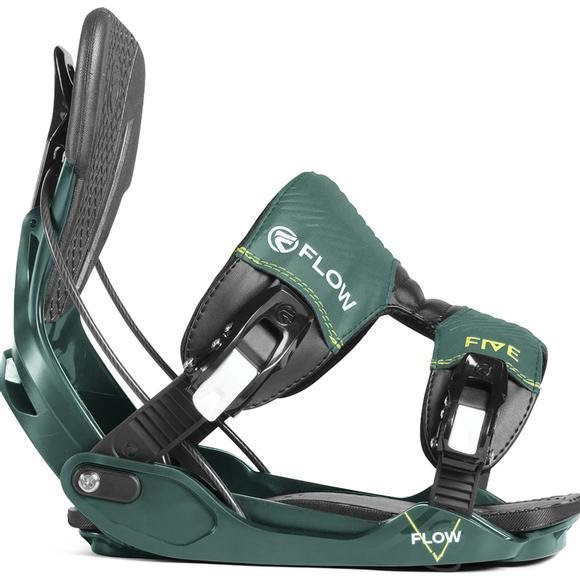 The Flow FIVE is for all-mountain riders searching for the right mix of support and comfort. The molded composite baseplate is extra-forgiving for all-day riding, and extra-wide for stability and easy-in easy-out SpeedEntry convenience. Both the UniBack highback with EVA wrap-pad cushioning and EVA 2.5° canted BankBed footbed add to the level of comfort. Engineered to transfer energy directly to the board without loss of efficiency. The minimized contact area with the board, channels your power where it needs to go while the rockered corners of the baseplate allow any type of board to maintain optimal flex. Featured on all Flow bindings. Lightweight 1-piece hibacks that fully recline for easy SpeedEntry and Exit and the comfortable EVA pads reduce the pressure on your legs. The Glass Filled Nylon Uni Backs offer more stiffness and response, while the Composite Uni Backs offer a forgiving, lively and fun feel. Fusion one-piece PowerStraps are 3D-shaped for a great fit, and cover a larger area of your foot for more comfort and control. These innovative Locking Slap Ratchet (LSR) buckles give you the option to easily get in and out of your bindings any which way you like. Whether SpeedEntry or DualEntry, they lock down to secure your preferred footstrap tightness.